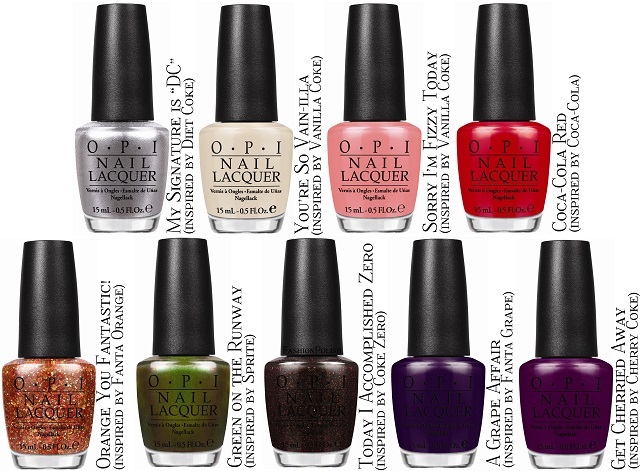 Fashion Polish: NEW OPI Coca-Cola Company Limited Edition collection! NEW OPI Coca-Cola Company Limited Edition collection! Coca-Cola by OPI will be available in both nail lacquer and GelColor formulas beginning June 2014. Nail lacquer shades each feature OPI’s exclusive ProWide™ Brush and will retail for $9.00 ($10.95 CAN) at Professional Salons, including Beauty Brands, beautybrands.com, Beauty First, Chatters, Dillard’s, jcp Salons, Pure Beauty, Regis, Trade Secret, ULTA and ulta.com. The 10 Pack of Style mini pack will retail for $24.95 ($29.95 CAN). GelColor is an in-salon, professional service only. Prices depend on the salon and range from $28 - $38 for a manicure and $35 - $45 for a pedicure. For more information, please call 800-341-9999 or visit www.opi.com. Follow OPI on Twitter and Instagram@OPI_PRODUCTS, become a Facebook fan, and share Coca-Cola inspired manicures using the hashtag #OPICokeStyle.